Mmmmm! PASTA. Growing up I lived on the delicious stuff; I brought penne with pesto to lunch at school, cooked tomato basil spaghetti at home, and ate pounds of tortellini the day before swim meets. Nowadays in light of my retirement from age group swimming an activity that allowed me to eat twice the amount of a teenage boy and maintain a weight below three figures I don’t indulge nearly as often, but when I do it is a real treat. This recipe is the kind worthy of occasional indulgence. It has a creamy sauce, spicy Italian sausage, and yummy sauteed onions. There are truly so many good flavors going on here that you’d be hard pressed to find a person who wouldn’t enjoy this; unless of course they’re a veg. On that note, if you or someone you’re feeding has dietary restrictions this is the perfect recipe because it’s so amenable to change. Don’t eat meat? sautee some portabello mushrooms instead. Lactose intolerant? toss with garlic scented olive oil and a little sea salt. Hate basil? use parsely or any other herb you prefer; the possibilities are endless. The version I’m proposing is my favorite. It derives from an excellent recipe by my mom that called for tortellini, but being me I couldn’t let a good thing lie and I made it my own. I swapped out the tortellini for penne, increased the sauce, and added in white wine. Try your hand at this version or use it as a springboard for your own original creation either way happy cooking! Bring a large pot of water to a rolling boil and cook penne until al dente ~11 min. Meanwhile in a large skillet heat olive oil over medium high and snip one end of each of the sausages. Squeeze the sausage into the pan breaking up with a spoon and stirring occasionally. After 2 min. add in the onion and garlic. Once the sausage is no longer pink turn up the heat to high and pour in the wine cooking for 30 sec. Now turn heat to low and stir in the half and half, Parmesan, tomatoes, and basil. Cook for 2 min then season with salt and pepper to taste (be sure to taste before seasoning! you might like it as is). Toss sauce with pasta and serve with red pepper flakes, extra Parmesan cheese, and a large glass of vino. * To chiffonade basil take the leaves and layer one on top of another and roll up into a cigar shape. Slice perpendicularly into ~1/8 inch slices. Tada! perfectly cut basil strips. Posted in Italian, main dish, pasta. 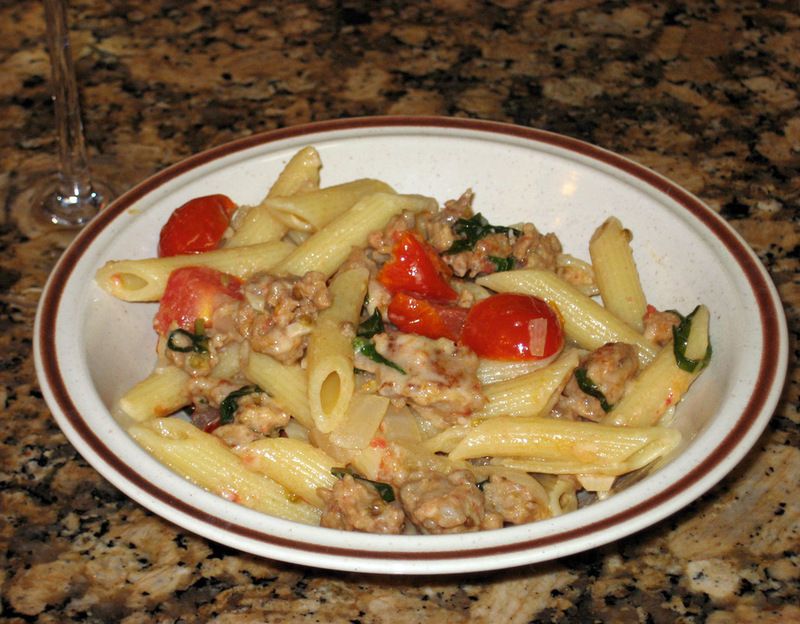 Tagged basil, EVOO, garlic, heavy cream, onion, parmesan, penne, sausage, tomato, white wine.